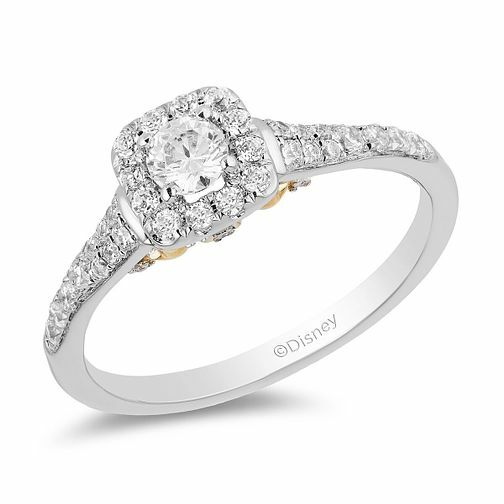 A captivating Enchanted Disney Fine Jewelry diamond ring, inspired by the favourite fairy Tinker Bell. Crafted from gorgeous 9ct white gold, an elegant and contrasting gallery presents a collection of stars in 9ct yellow gold and set with shimmering stones. A round sparkling centrepiece is complimented with a cushion halo, whilst the dazzling diamonds carry onto the shoulders. An elegant and enchanting design, this ring presents a total diamond weight of 0.50ct.